A story in pictures and words. In late November 2013 I flew to Texas from my home in Michigan. My son Kyle arranged for us to spend Thanksgiving in Big Bend National Park. Cover of the book "Death in Big Bend"
Kyle bought me the book "Death in Big Bend" after our adventure. A friend of Kyle's offered us his vintage, 1983 Dodge Falcon for the trip. We were riding in style! We drove through San Antonio on the way to Big Bend. 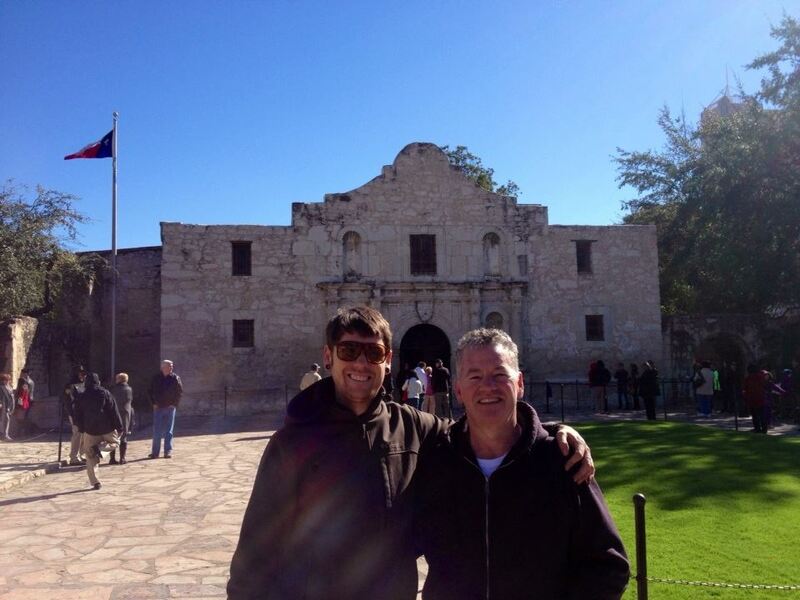 I am glad that Kyle remembered the Alamo. Thanks, son! We made it to Big Bend National Park and set up camp. The first day we took a nice hike. That night we enjoyed a great Thanksgiving dinner by the campfire. 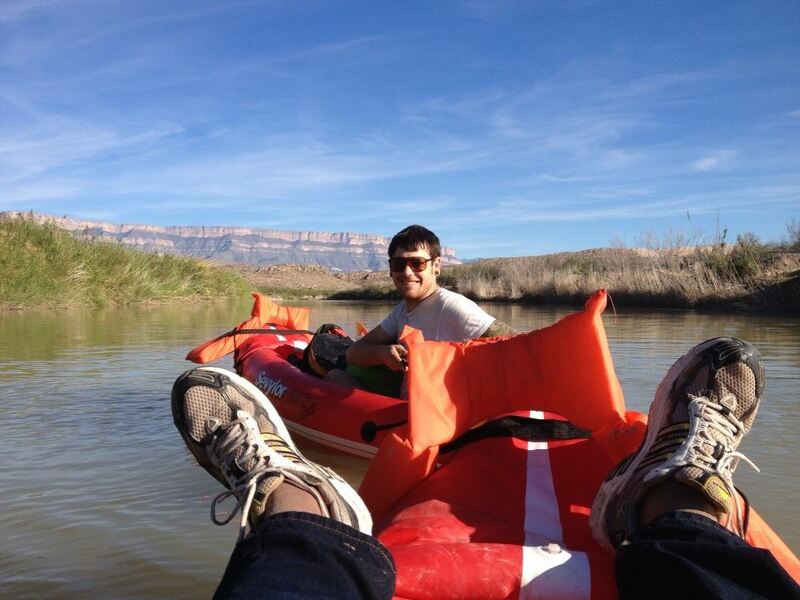 The next day Kyle arranged for us to kayak down the Rio Grande. It was a beautiful trip. We saw unbelievable scenery and wild horses along the shore. We started our adventure at Hot Springs, our entry point, and we were lazily working our way down to our departure point Boquillas, as can be seen on our permit. The plan was to make the three-hour trip down the Rio Grande, and then for Kyle to hike the three miles back to get the van and pick me and the kayaks up. We were enjoying our journey down the river when I started to realize the sun was dropping very fast. It was rapidly getting cold and dark. We were now well past our three-hour estimated time. I mentioned to Kyle that the cliffs near our campsite were well behind us now. We tried to check our cell phones for GPS to see where we were, but we had no signal. We did know that we were in the largest desert in North America, The Chihuahuan Desert. At night, the temperatures dip below freezing. It also has the distinction of being named by the International Dark-Sky Association as one of the ten darkest skies in the world. This is great if you want to gaze at stars or see the Milky Way. But not if you are in a leaky kayak in the middle of the Rio Grande with nowhere to get out. My mind went back to signs we had seen earlier that day. I knew that we were in real trouble. Because, the first thing the sign said to do was to pick up small children if threatened by a lion. And we did not have any small children to pick up if we were attacked. We realized that we had missed our departure point. We paddled along further, anxious to see something hopeful around each bend. At one point, we went ashore. Kyle started working his way through the high brush to see if he could find the road that would lead back to our van. He suggested the best place to exit the river would be after the Boquillas Canyon. Which we were now approaching. The literature describes it as such: “The Rio Grande on the eastern side of Big Bend National Park cuts through the Sierra del Carmen Mountains of Mexico, creating beautiful Boquillas Canyon. Picturesque rock formations, very gentle rapids, and steep canyon vistas rising as high as 2,600 feet. A point where the river is officially wild and scenic, about 20 miles long”. Boquillas Canyon? Thank you Senor’. But that is not an option. We kept working our way down the river knowing that we would have to get out before entering the canyon. Kyle was getting a little anxious himself. He was considering another attempt at making it to the road. We were offering up a few earnest prayers. We then came around a bend and saw a silver pickup truck on the United States side of the river. It turned out to be a couple that had driven out at dusk to veiw the entrance of Boquillas Canyon. They were parked up on a scenic overlook. Kyle ran toward them yelling, “Help! My dad has a condition…Help…” We loaded our kayaks in the back and they drove us the 7 miles back to our van. We didn’t pass another vehicle on the way. We were out there alone. The next morning as the sun rose we saw that the people camped next to us were the ones that had rescued us. We should have been better prepared. We will be when we go back and kayak through the Boquillas Canyon. Who wants to join us?